When you experience a memorable evening of music and dancing, who gets the credit? Rather than wait for an epiphany on the dance floor, now is the time to ponder the association between the Balkan Music & Dance Workshops and the final product of the many bands, choirs and dance organizations that owe so much of their repertoire to the EEFC, and why it’s good for such groups to support the EEFC by becoming contributing members. Money from our fundraising drives helps the EEFC keep a steady, reliable income stream to ensure the continuation of our good works: providing a safe and open venue for experienced and beginning musicians and dancers to meet, mix, learn from one another, and share their art. Another excellent way to support the EEFC is to steer more potential campers to the Workshops. If every one of the nearly five hundred campers nationwide each told ten people about camp, we could entice a large group of newcomers to the fold, so we’d never have under-attended camps. Therefore, I, Craig Kurumada, hereby pledge to tell at least ten people about Balkan camp. I plan to talk to leaders of a couple of local bands with a good deal of brass players, some talented dancers at an arts school, and members of various choirs and song circles in my neighborhood. Ten people? It’ll easily morph into twenty. Won’t you join me in my pledge? What happens if newcomers balk at the tuition for camp? Your own folk dance or music group can be of service! In our town, Arcata, California, the local folk dance group, the Humboldt Folk Dancers, allots a part of its annual budget to support people going to music and dance camps. From our experience, we recommend doing the kinds of activities you’re already comfortable with and can do with relative ease, for example, a one-time party with a prize drawing and a slightly elevated entrance fee. Tack on an extra buck or two. If you only raise a hundred bucks, do it three or four times a year. 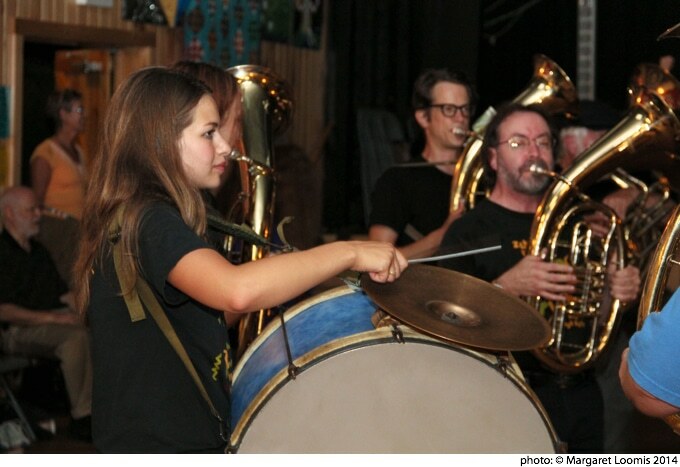 If you have a band, play one or two shows a year with the door set aside for camp scholarships. Small contributions in money and effort over time will pay significant rewards. Investing in music for dancing, as we know from those great moments on the dance floor, is worth it. I invite you now to be part of the Great Balkan Camp Ripple Effect. Support the EEFC by donating money, spreading the word, and supporting your local community’s workshop attendees. Have other ideas or want to know more about HFD’s experience with funding local scholarships? Write to Craig via the EEFC Office and put “Attention: Craig” as the subject.